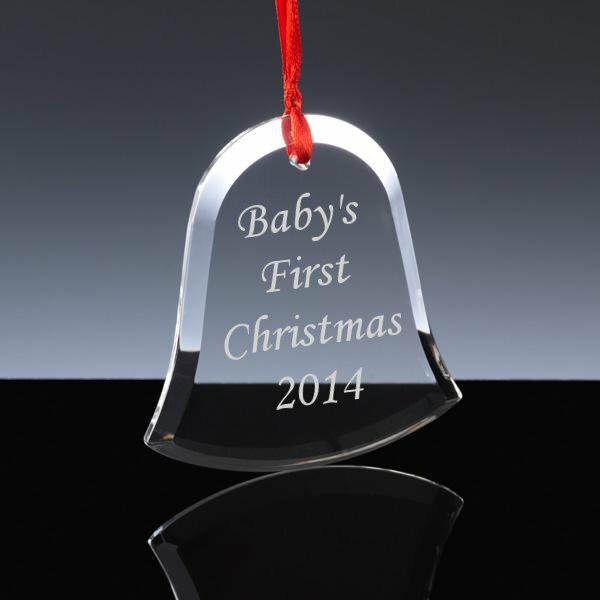 This engraved Bell Christmas Tree decoration is 6mm thick optical crystal with a bevelled edge, and is a perfect personalised christmas tree decoration, or even a gift for a baby's first christmas. The price of the engraved bell christmas tree decoration includes up to 20 characters engraved for free, and then any additional characters to personalise the bell christmas tree decoration are then charged at 25p each. The engraved bell christmas tree decoration is supplied on a red ribbon, and the size of bell christmas tree decoration is approximately 2.75" wide and 3.15" high, with an engraving area of 1.4" by 1.5". The postage rate of the engraved bell christmas tree decoration is band A.